The T-45 Goshawk is a fully carrier-capable version of the British Aerospace Hawk Mk.60. It was developed as a jet flight trainer for the United States Navy and United States Marine Corps. The Goshawk's origins began in the mid-1970s, when the US Navy began looking for replacement for its T-2 and TA-4 trainers. British Aerospace and McDonnell Douglas proposed a version of the Hawk and were awarded the T-45 contract in 1981. The Goshawk first flew in 1988 and became operational in 1991. On 16 March 2007 the 200th airframe was delivered to the US Navy. The final delivery of the 221st aircraft took place in November 2009. Many RC models of the T-45 have been produced over the years, due to the aircraft's great looks and superb handling. 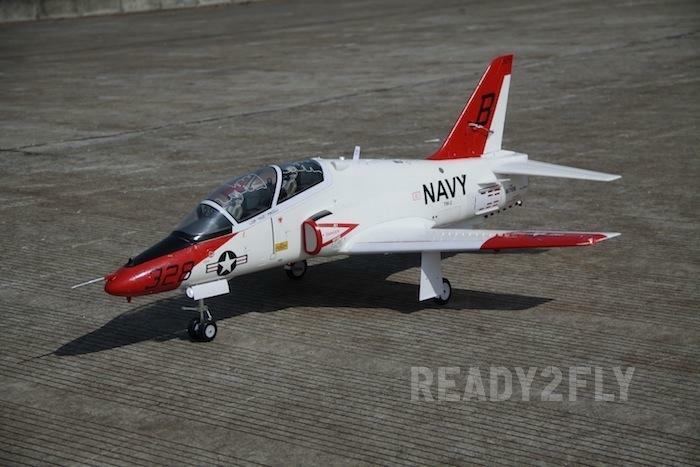 After 150+ test flights, we believe this is the best foam RC PNP scale T-45 Goshawk in the world today. To stand apart from other T-45s from past manufacturers, this PNP model features many scale details and introduces newly designed plastic servo actuated speed brakes and plastic wormgear-driven slats. These slats are the first production release of a proper slat in a foam model of any size, and use aluminum tracks to ensure proper extension geometry. Other plastic details include a row of turbulators on the wings, exhaust nozzle, pitot tubes, antennas, arrestor hook, and cockpit parts. The sequenced landing gear utilize a four part nose door like the real T-45, and a three part main door assembly. The struts replicate the stance of the T-45, complete with long travel trailing link mains and a nose strut with tow bar and landing light. All control surfaces, lights, and doors are managed by a single junction board complete with quick disconnect wing harnesses, providing a very tidy cockpit. Say goodbye to unsightly jumbles of wires in your battery bay!